Invoke Mother Nature right inside your old jam jar! Now you can enjoy rain whenever your heart wishes for it. And you will only need a jar, a plate, some water, and ice cubes to make it happen. Intrigued? Check out this science experiment now to discover how to do it. 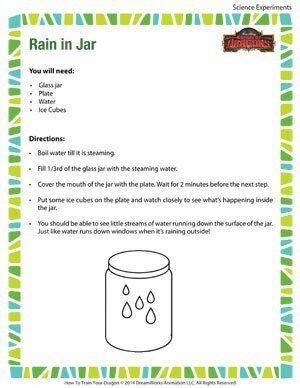 Once you are done with that, don’t forget to check out other interesting and fun science experiments for kids to make learning science a joyride!